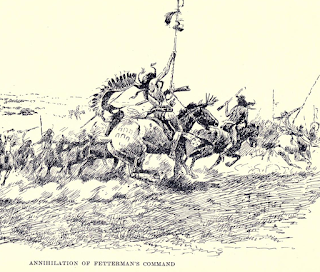 returning to the battle known as Fetterman Fight - and the Cheyenne account of this day, unfortunately and sadly I could not publish this on the day of the struggle. the fort and that someone who was with the soldiers made motions to the young Indians to go away, that the soldiers were going to eat. This was the Indian understanding of the signs, whatever they may have been. The Sioux signed back to them that to-day they would get a full stomach of fighting. The soldiers re-entered the post and the young Indians remained in sight riding about. After a time a number of bugle-calls were heard and soon after a troop of cavalry marched out of the post toward these young men, and after them a company of infantry. At a bugle-call the cavalry charged and fired at the Indians who, of course, ran away. This was the distant shooting heard. It was some time before the watchers heard any more shooting. The cavalry after firing had stopped, and would follow no longer, and the Indians were obliged to return and attack again, be shot at, and followed a little farther. In this way the infantry kept well closed up with the cavalry, which was perhaps the reason the cavalry followed slowly. After the third and fourth volleys the shooting came closer, and before long some of the Indians came riding down the ridge and a little later another man, Big Nose, the Cheyenne, mounted on a black horse, was seen riding back and forth across the ridge before the soldiers, seeming to fight them and they were shooting at him as hard as they could. It looked as if Big Nose was trying to fight and hold back the soldiers in order to help someone ahead of him to get away. From the place where the Indians were waiting Big Nose seemed almost against the soldiers. The great body of Indians bidden along the ridge kept themselves well concealed. Not a move was made nor a sound heard. After Big Nose, followed slowly by the soldiers, had come down off the steep ridge the troops stopped, and Big Nose charged back and seemed to go in among the soldiers so that he was lost to sight. He went into the troop from the right and came out on the left, wheeled his horse, rode into them again and came out, and turned as if to go back. hidden behind two rocky ridges on the east side of this ridge, while the Cheyennes were on the west side of it. It had been announced that a certain Cheyenne, Little Horse, who was a Contrary*, should give his people the word to charge, and when the proper time came this word was to be passed on from one to another until all were notified and then all should spring up and charge. into two parties, riding away from each other, and then, turning, came back and crossed each other. This was very likely a signal, and the Indians charged. hand behind his neck and grasp the contrary lance with his right hand they knew that he was about to charge, and all sprang up. When the charge was made the sound of many hoofs made a noise like thunder and the soldiers began to fall back. On the ridge near the place where it leaves the hill are many large loose flat stones. The infantry took a position behind these. The cavalry moved back up the hill and stopped. On the infantry hidden among the rocks a a Sioux came charging down the old road and the infantry stood up in sight as if about to leave the shelter. They did not do so, but let the Sioux pass through them and after he had passed fired at and killed him. Soon after this another man came down the road on foot and began to shoot at the infantry and -what they rose up to shoot at him the other Indians shot at them. This young man was killed. through or over the crowd of troops. at the rocks about a hundred yards north of the line of cavalry. Then the cavalry began to fall back, but slowly and in order. Some were even on foot leading the horses. 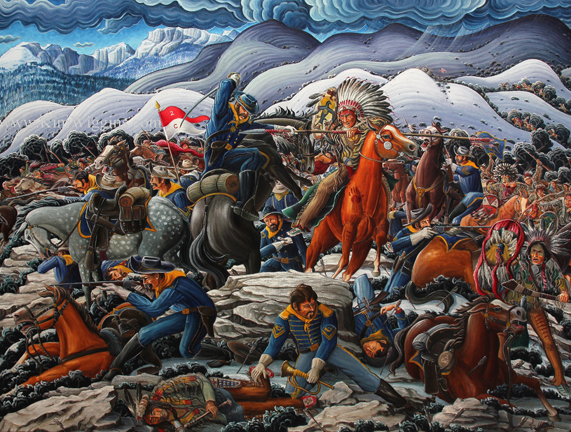 After the infantrymen had been killed the Indians rushed up toward the cavalry, but the ground was slippery with ice and snow and in many places the hill was too steep for them to charge up it. Still many people crept up toward the place, and Little Horse is reported to have approached behind the rocks within forty feet of the soldiers, and fought there, yet he was not hurt in the fight. 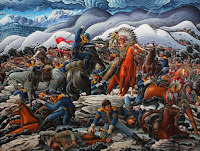 While this was going on White Elk was a little behind, where he could see the Indians shooting at the cavalry with arrows, and the arrows flew so thickly above the troops that to him they seemed like a lot of grasshoppers flying across each other. On the hill an officer was killed and when he fell the troops seemed to give up and to begin to fight their way up the ridge. The weather now grew very cold, so that blood running from wounds soon froze. After the soldiers had reached the end of the ridge they began to let go their horses and the Indians, eager to capture the horses, began to lessen their shooting. and here Big Nose was shot off his horse. This was the only wound he had and his horse was untouched. White Elk went to where his friend lay. He spoke to White Elk and said: "Lift my head up the hill and place me where I can breathe the fresh air." This was all he said. He breathed for a day or two after this. Big Nose was killed on the ridge in the first sag northwest of the monument, near some large rocks west of the crest of the ridge. His horse stopped as he was crossing the ridge and began to back toward the soldiers, who were west of where the monument is. While White Elk was helping Big Nose the soldiers were shooting at them constantly. ready?" And others would call back: "We are ready." They were preparing for the charge — a hand-to-hand fight. When at last the order was given to charge they rushed in among the soldiers and a number of Sioux were killed among the soldiers. Here they killed every one. After all were dead a dog was seen running away, barking, and someone called out: "All are dead but the dog; let him carry the news to the fort," but someone else cried out: " No, do not let even a dog get away " and a young man shot at it with his arrow and killed it. The last of the cavalry was killed just where the monument now stands. The fight began when the sun was quite high in the heavens and ended about noon. Little Horse led the Cheyennes in the charge which had been ordered. All watched him and when he went forward they followed. Only two Cheyennes were killed.